Every child WANTS to believe in Santa Claus, and those years when they start to doubt are tough for parents. Bug just turned 8 and he has lots of questions about Santa. I can tell he's really trying to hold on to the belief. I know time is fleeting. But I think we have one more season of belief. What if there was an easy, inexpensive way for you to ensure that Santa Claus remains a strong belief in your child's heart? Well, there is! Kids love letters from Santa... but how about a whole package from Santa? 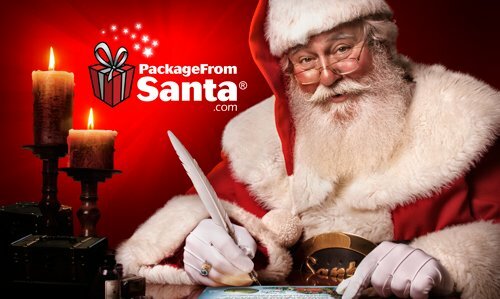 PackageFromSanta.com offers you a choice of 3 unique treasure chests of authentic, custom Santa Claus goodies, sent right to your child, directly from the North Pole! It's a bundle of proof with YOUR CHILD'S NAME ON IT! Every Package is painstakingly crafted, packed and shipped with care and even includes a real Santa return address and genuine North Pole Stamp! Bug was SO excited to get his Package from Santa! His favorite part? The NICE LIST CERTIFICATE! 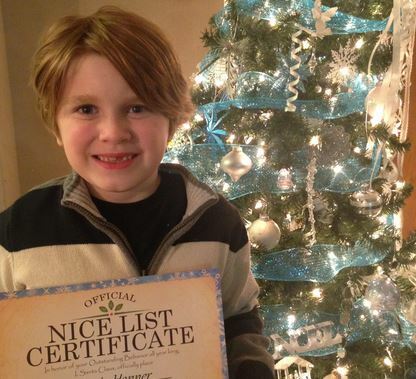 He is SO proud of his Nice List Certificate! He asks me at least twice a day, "Can you believe I'm on the NICE LIST?" Sometimes I want to say, "Nope, I can't believe it!" :D I'm kidding - he's a good kid. He deserves to be on the nice list! But that's not all! Santa further proves his existence with a Personalized Phone Call & Personalized, Movie-Quality Video starring your child! That's a $15 value, absolutely FREE with EVERY package! Hearing, touching and seeing is BELIEVING! Result?? No more non-believers! (Be sure to have your camera ready!) Watch a VIDEO from PackageFromSanta.com now to learn more. My loyal readers get an exclusive 25% discount on every Package From Santa now! 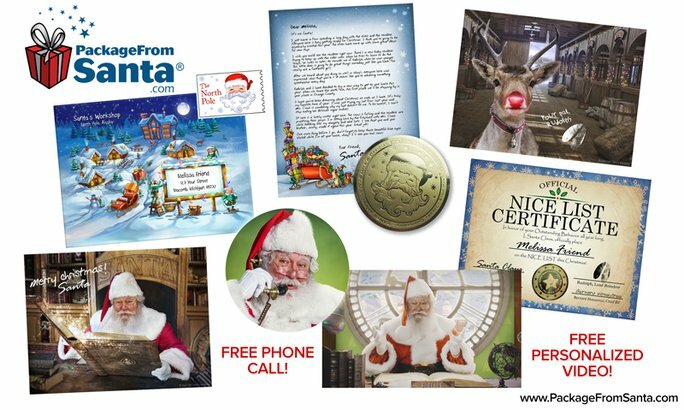 SAVE 25% OFF every Award-Winning Personalized Santa Letter Package (even the Platinum Package!) sent directly to your child from the North Pole! **BEWARE! ** Of online Santa Letter copycats! Only PackageFromSanta.com has an A+ Rating with the Better Business Bureau and top-notch customer service for over 10 years. And don't forget Santa's Super-Satisfaction Guarantee: YOUR child (and you!) must be absolutely delighted - 100% thrilled in every way - or we'll send you a prompt and cheerful refund, no questions asked. Questions? The Christmas Cheer Team is happy to help! 866-894-4789. Did you know that believing in Santa actually helps boost children's mental development and social skills? It's true. According to psychiatrist Lynda Breen, "The festive ritual of exchanging presents associated with Santa helps develop a child's sense of charitable giving as well as their consideration of others less fortunate than themselves." And what better way to keep them believing than with the World's #1 Personalized Santa Package? Each one says, "Santa's thinking of you... you're very special to me... and I'll be visiting YOU soon!" It Is Worth It To Get A Package From Santa! Bella Received a Package from Santa! What's Inside?! There is Still Time for your Package from Santa | 25% off Offer HERE! Santa Sends Your Child A Personalized Package From The North Pole! Package from Santa: So fun! Who Wants to Receive a Package from Santa? Wow! Santa is almost here! Keep your kids on the Nice List! Package From Santa: Bring Home The Magic This Holiday Season! Package from Santa Will Have Your Child Believing! PackageFromSanta.com Is Sending Christmas Magic One Package At A Time! Wonderful Surprise package for the holidays. The best Christmas Package Ever! Look who sent us a letter! Package From Santa Made My Daughter's Day! Aiden was ecstatic to open his Package From Santa! Our Package Fron Santa Review! Get A Package From Santa! We Received Our Package From Santa! A Package from Santa has Arrived! From the North Pole! Surprise Your Child With A Personalized Package From Santa! I have never seen a gift like this in my life! It was better than I expected!!!! Thank you for keeping us all believing! Keep your child BELIEVING with a personalized PACKAGE, VIDEO & PHONE CALL FROM SANTA!